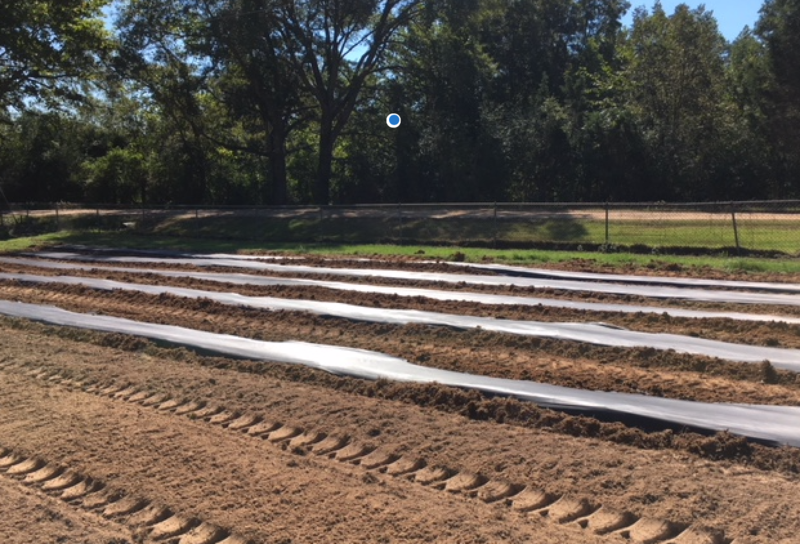 The use of plastic polyethylene mulch has become increasingly common in vegetable production in Alabama in the past few decades. 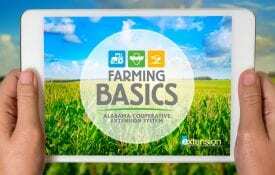 Plastic mulch growing practices are used on a wide range of fruit and vegetable crops in Alabama, including strawberries, watermelon, muskmelons, tomato, pepper, cucumber, squash, and brassicas such as collards, broccoli, and cabbage. While the use of plastic mulch is common, it important to understand how to use plastic mulch, the benefits and drawbacks, and the different types of plastic mulch products available. The most widely used and economical plastic mulches are embossed black polyethylene films with irrigation drip tape installed under the mulch. 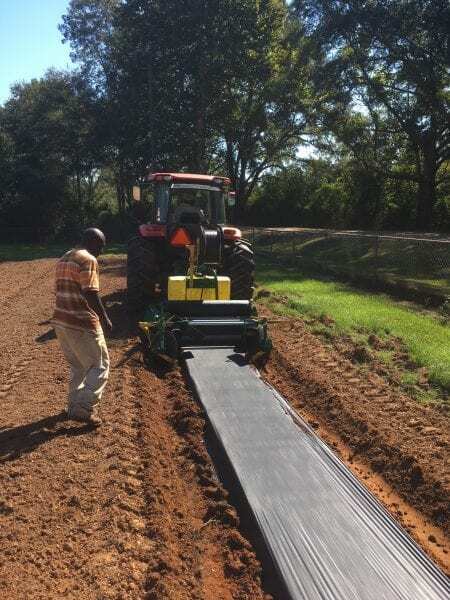 Usually mulch is applied by a tractor-drawn mulch layer implement, which lays the plastic and drip tape into beds while anchoring the edges with soil. It is important that soil is well prepared before laying the plastic mulch to ensure a tight fit between mulch and soil, as any clumps of grass, sod, weeds or soil make proper application difficult. All chemicals and most fertilizers should be applied during bed preparation. 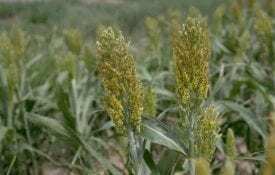 The remaining fertilizer can be applied throughout the growing season as a soluble liquid through the drip irrigation system using a fertilizer injector. Supplying fertilizer through the drip irrigation system is crucial in sandy soils where any initial fertilizer is likely to leach away from the plant root zone. Management of weed growth in the alleys between mulch beds should be taken into consideration, and tactics for controlling these weeds include mowing, cultivating, using organic mulch, or cover cropping. Weeds that emerge in planting holes in the mulch should be hand removed early, especially vining species like morning glories and bindweeds. Plastic mulch can be double cropped, where a second crop is grown on the mulch after the first is harvested. Fertilization for the second crop should be applied through the drip irrigation system. 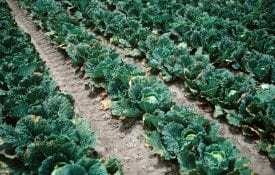 There are many benefits to growing vegetables on black plastic mulch. Black mulch increases soil temperature in the bed, which allows for faster development and earlier yields in spring and early summer crops. Plastic mulch inhibits weed growth around crops. Plastic mulch keeps crops clean, and can aid in the prevention of fungal disease through reduced soil splashing. In addition, mulch aids in soil moisture retention, prevents soil compacts, and reduces erosion and leaching. Disposal of plastic mulches is among the biggest challenges of this technology. Removal from fields is time consuming and expensive. Polyethylene plastic is not biodegradable and not readily recyclable. As such most plastic mulch is either disposed in landfills, stockpiled, or burned on farms. Mulch removal at the end of the season is required for certified organic growers. Beyond the challenge of disposal, the major drawback of plastic mulch systems in the initial costs for specialized equipment including a mulch layer, the mulch and drip tape, a transplanter, and a fertilizer injector. The most common plastic mulches used are plain or embossed black polyethylene films with thickness between 0.8-1.25 mil, and 4 feet width. Black mulch will raise soil temperatures from 3-5 ° F. Black plastic is the least expensive option, but different mulch products can provide other properties. Clear plastic mulches: Translucent clear plastic mulches transmit solar radiation to the soil and block the radiation from escaping. This creates a mini- greenhouse under the mulch, and soil temperatures can be 8-14 ° F higher while using this mulch. However, clear plastic mulches allow light through and weed germination and growth. Weeds eventually tear the plastic and compete with the crop. Clear plastic mulches are not recommended in Alabama due to weed issues, but can be useful if applied during hot weather as a way to solarize soil and kill plant pathogens and some weed seeds. White plastic mulches: White mulch will reflect incoming solar radiation, and soil underneath white plastic will be cooler compared to bare soil. White or white-on-black mulch is commonly used for fall crops when soil is already warm during establishment and black plastic has the potential to overheat plant roots. Silver/Metallic plastic mulches: Research has shown that silver mulches can confuse and repel plant pests such as aphids and flower thrips. This product can be useful when growing peppers or tomatoes, as thrips are the main vector for tomato spotted wilt virus. Soil under silver plastic will be several degrees cooler than black plastic. Infrared-transmitting (IRT) plastic mulches: These films absorb certain colored wavelengths but transmit heat (infrared) radiation to the soil. These materials heat soil as efficiently as clear mulches, but reduce the weed germination issues. Colored plastic mulches: Red, blue, orange, and yellow mulches have all been developed to have distinct radiation reflected into the crop canopy. Research into colored mulches has shown inconsistent results, and these are not widely used in Alabama. Biodegradable mulches: Biodegradable mulches have been developed in response to removal concerns of plastic mulches. These mulches are designed to be tilled into the field and break down over time in the soil. These products can perform as well as polyethylene mulches in heating soil and preventing weeds. Biodegradable mulches cost significantly more than polyethylene plastic mulch. None of these products currently meet National Organic Program (NOP) standards for use in certified organic systems.